"While we talk about the death of newspapers with great regularity it gets to be old news real quickly and even starts to feel a little mean. 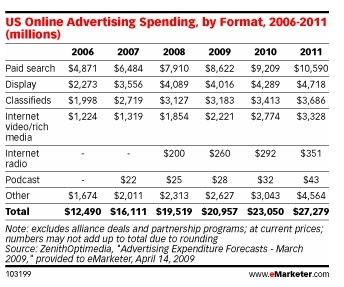 So to relieve that pressure eMarketer has come out with a report that is evidence of the decline and fall of another old friend, radio. Terresttrial radio is what we are talking about here. Good old fashioned over the airwaves kind of radio is heading in the same direction as newspapers which is sad but just another harsh reality of the shift in the media of the future." Za nejzajímavější část článku považuji informaci o prognóze vývoje nákladů vynakládaných na reklamu v on-line mediích v USA do roku 2011. Kopii tabulky najdete na adrese: www.akamonitor.cz/prognoza.jpg. "What are your habits when it comes to radio? I know mine have changed significantly but it’s still on when I am in the car. The difference is that I listen now for different reasons and will quickly play a CD or whatever once there is nothing to being offered on the air. As for Internet radio? I’m not quite there yet but that may just be me." Autorem článku je: Frank Reed. Frank Reed's blog "Frank Thinking About Internet Marketing" provides practical advice and insight for Internet marketers from local SMB's to Fortune 500's.